Everyone is feeling pretty proud of themselves for making this ALS Ice Bucket Challenge a popular charitable trend, and it's hard to be cynical about something so silly doing so much good. 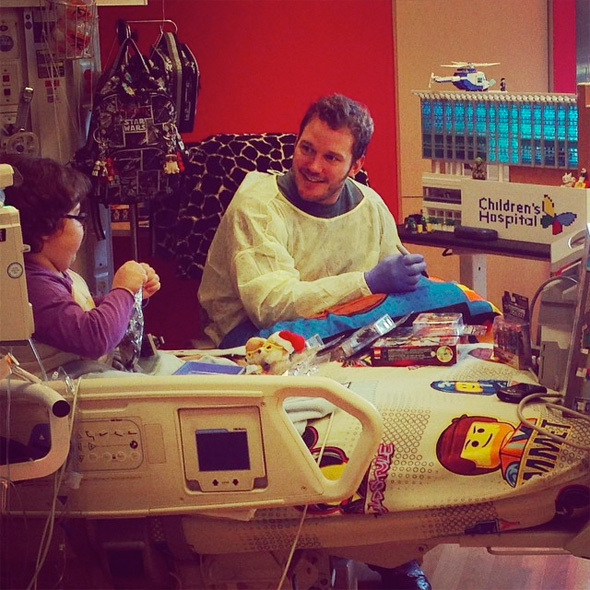 Guardians of the Galaxy star Chris Pratt even partook in the challenge himself, but it's another heartwarming gesture of generosity that has a lump in our throats. Pratt was able to hook Marvel up with Children's Miracle Network Hospital to arrange a special screening of the sci-fi adventure for patients and their families at Children's Hospital in Los Angeles earlier this week. But that's not even the coolest part. More below! Pratt hung out with Prunty, gave him some Guardians of the Galaxy LEGO sets, signed his LEGO Movie bed set and quoted lines from the hit animated movie with him. This story (via E! Online) is overwhelmingly sweet, and it shows that Chris Pratt is nothing short of a real hero. It's incredible to see what Pratt is already doing with his newfound worldwide fame following the success of the Marvel film, and it's a powerful reminder that even when there's dark things happening around the globe, there's still good in the world. Awesome of him for doing that, but a big shout out for the people who do that everyday who are not famous, namely the parents, families and volunteers. Wow. How touching. What a stand up guy. What is this wet stuff forming on the corners of my eyes? Human bean juice. Well...clear salty human...bean...juice. nevermind. This guy is something else! What a great man! This was super. Pratt is the man. Ohhhh I get it! Why all caps it though? Aww... what a sweet guy! I love him in Parks and Rec and thought he was just great in Guardians but this is even better. What a sweet, sweet guy.